Fractional, or “shared” ownership of small aircraft has become an ideal method of aircraft ownership for some pilots. Others, however, find shared ownership to be expensive and inefficient. Let's analyze the shared ownership costs of a popular light aircraft, the Cirrus SR22 in comparison to full ownership, and the less-refined option of aircraft rental. Shared ownership of small aircraft came about as a result of a few companies seeking to reduce the ownership costs of small aircraft and expand the pool of buyers. The initial companies modeled their companies after fractional ownership companies in business and corporate aviation. Since then, the business model has been adjusted to more closely fit general aviation customers. In a Flying magazine article, Robert Goyer discusses a few advantages and disadvantages of fractional ownership with a company called AirShares Elite. Though the company shut down in 2014, the pros and cons described, remain the same. Shared ownership, while not for everyone, can be beneficial to the high-end general aviation buyers. Instead of paying full price for a new aircraft, fractional owners can often buy into a 1/8th, 1/6th, or 1/4th share and pay a fraction of the market price, reducing the complete costs of ownership. Take, for example, a Cirrus SR22 at a price of around $600,000. Few people can afford the cost of the aircraft in its entirety; however, shared ownership significantly lowers the costs. In one example, a buyer can purchase 1/8th of a Cirrus SR22 for about $40,000, plus a monthly fee of about $900. Additionally, the buyer pays $100 per flight hour in operating costs. Total, the buyer would pay for the aircraft, plus, perhaps, about $25,500 per year. It is a cost saving compared to the purchase, operating and maintenance costs of a brand new Cirrus SR22, which we can estimate at about $600,000 plus at least $20,000/year in operating and maintenance costs (see: AOPA cost calculator). Another benefit of shared ownership includes the “no-hassle” operations of the plane. The shared ownership company takes care of everything from scheduling to maintenance, leaving the buyer with no worries. It is a worthwhile benefit to many, as maintenance for an aircraft can be costly and time-consuming. Additionally, the opportunity to fly brand new aircraft with state-of-the-art technology is an attractive advantage for some people. Disadvantages of shared ownership include maintaining a lower-than-normal equity in the aircraft. And some shared ownership companies give their “buyers” no equity in the plane at all. Scheduling can be restrictive, and the hours a buyer is allotted may only add up to about 75 hours per year on average. With aircraft rental between $200-300 per hour, 75 hours per year would cost about $15,000-22,500, a small fraction of the price of either shared or full ownership. Also, the location of these shared aircraft may be an inconvenience, as many of the aircraft are based at certain locations, which may or may not be near the buyer. Shared ownership of a small aircraft can still be quite expensive, but it depends largely on the individual buyer's preference. For buyers that have the money and are seriously considering the purchase of an airplane like a Cirrus SR22, shared ownership may be ideal. It certainly is ideal for those that don’t want the hassle of maintenance or legal requirements associated with full aircraft ownership. Additionally, for those who place value on status and prefer a new, technologically advanced (TAA) aircraft, shared ownership would work out well, as the option to buy into new aircraft presents itself yearly. 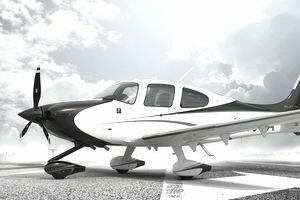 For the average buyer, though, the costs may still outweigh the benefits of shared ownership for aircraft in the same category and price range as the Cirrus SR22. Many pilots would find a 3-4-year-old used aircraft to be sufficient for their needs, and most will still find renting to be the most affordable option yet.